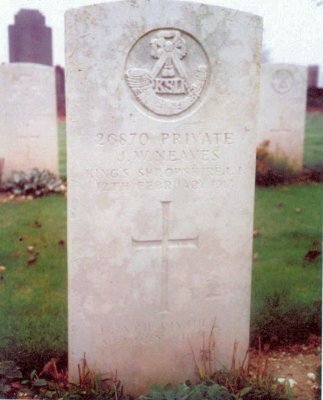 Private 20870 John Wallis Neaves, King's Shropshire Light Infantry. Private 20870. 5th Battalion, King's Shropshire Light Infantry. Died: Monday 12 February 1917, aged 35. Born: 1881 in Barrington, Cambridgeshire. Conscripted: Meldreth, Cambridgeshire, 2 August 1916. How died: Trench Pneumonia and Subsequent Kidney Failure. 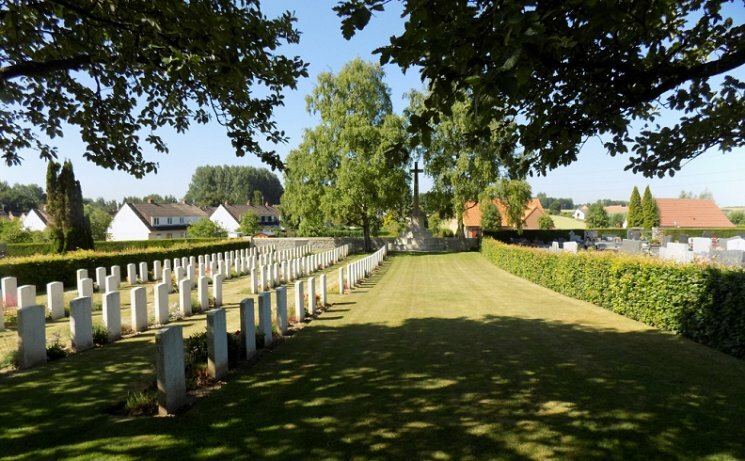 Theatre of War: France and Flanders. 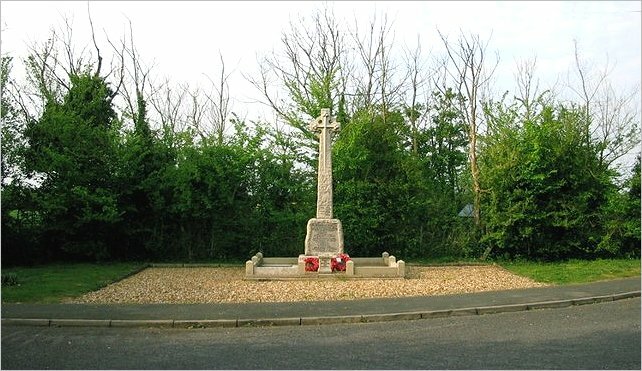 John 'Jack' Wallis Neaves was the eldest son of Charles Neaves and Sarah (Papworth) of Barrington, born in 1881. 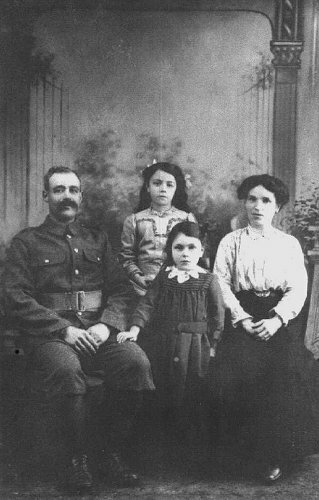 He married Emma Neaves (nee Watts)(1880-1964) of Wimpole on the 20th April 1908 at Mitcham in Surrey. Daughter Elsie Neaves (1909-1998) was born at Wimpole on the 4th July 1909 followed two years later by daughter Ethel Neaves (1911-1964) on the 26 May 1911. After his marriage to Emma they lived in a cottage in Old Wimpole called 'The Woodyard'. Jack was an estate carpenter. He also 'did the gas for Wimpole Hall'. His photograph is on page 90 of the Wimpole Hall National Trust booklet [he is standing beside his uncle Albert in the Timber Yard, five from the right]. By the time he was conscipted he had been employed for 15 years on the Wimpole Estate and was 35 years old. 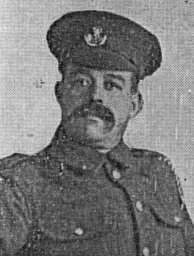 Jack enlisted in Meldreth on the 2nd August 1916 into the 11th Battalion of the Suffolk Regiment (regimental number 35188). Before he shipped to France in November, he was transferred to the 5th Battlaion of the Kings Shropshire Light Infantry, where he was Private 20870. While he was in the trenches near Arras he was taken ill during the 10th February and died of pneumonia and kidney failure two days later. He had been in the army for just over six months. Cemetery: Avesnes-le-Comte Communal Cemetery Extension, Pas de Calais, France. Avesnes-le-Comte is a large village in the Department of the Pas-de-Calais, approximately 20 Kms west of Arras and 18 Kms south-east of St. Pol. The cemetary extension, contains 333 graves, 4 of which are unidentified. 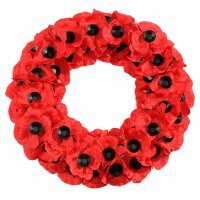 as shown on the Cambridgeshire County War Memorial in Ely Cathedral. John Wallis Neaves for this page. Please contact us via the contact e-mail address below.